DOHA, Qatar, 2017-Oct-12 — /Travel PR News/ — In order to meet rising passenger demand, Qatar Airways has announced plans to upgrade service on its Seychelles route to an A330 aircraft, starting 29 October 2017, as the award-winning airline prepares to celebrate its one-year anniversary of flying to the Seychelles later this year. The 260-seater A330 aircraft will increase the airline’s current daily capacity by 130 per cent on this route, connecting Seychelles-based passengers to more than 150 destinations globally. Qatar Airways launched service to the Seychelles in December 2016, and has since contributed to the development of tourism and the growth of local business in the Seychelles. The Airbus A330 aircraft, which features 24 seats in Business Class and 236 seats in Economy Class, enables passengers to enjoy the airline’s superior entertainment system, Oryx One, offering countless entertainment options. 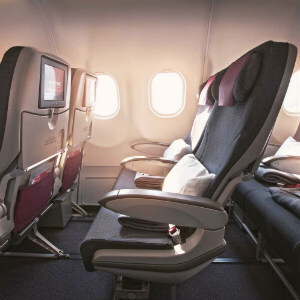 Business Class passengers can also relax in flatbed seats, offering an unsurpassed standard of comfort on board. Qatar Airways operates to 20 destinations in Africa, including Addis Ababa, Algiers, Cape Town, Casablanca, Durban, Johannesburg, Khartoum, Lagos, Marrakech, Nairobi and Zanzibar, among others. The award-winning airline has received a number of accolades this year, including Airline of the Year by the prestigious 2017 Skytrax World Airline Awards, which was held at the Paris Air Show. This is the fourth time that Qatar Airways has been given this global recognition as the World’s Best Airline. In addition to being voted World’s Best Airline by travellers from around the world, Qatar’s national carrier also won a raft of other major awards at the ceremony, including Best Airline in the Middle East, World’s Best Business Class and World’s Best First Class Airline Lounge. The airline’s hub, Hamad International Airport, is the first in the Middle East to receive an accolade from Skytrax, which only awards the 5-Star Airport rating to airports that achieve the highest overall Quality Performance, recognising the provision of excellent facilities for travellers and high quality airport staff service. Only six airports in the world hold this prestigious title, including Singapore, Seoul, Hong Kong, Tokyo-Haneda and Munich. Passengers transfer through our hub in as little as 45 minutes, seamlessly connecting to more than 150 destinations on Qatar Airways’ network. Qatar Airways will be adding many more exciting destinations to its network in 2017 and 2018, including Canberra, Australia; Chiang Mai, Thailand and St. Petersburg, Russia, to name a few. This entry was posted in Airlines, Airports, Flights, Travel, Travel Services, Travelers and tagged A330 aircraft, flight to Seychelles, Qatar Airways. Bookmark the permalink.